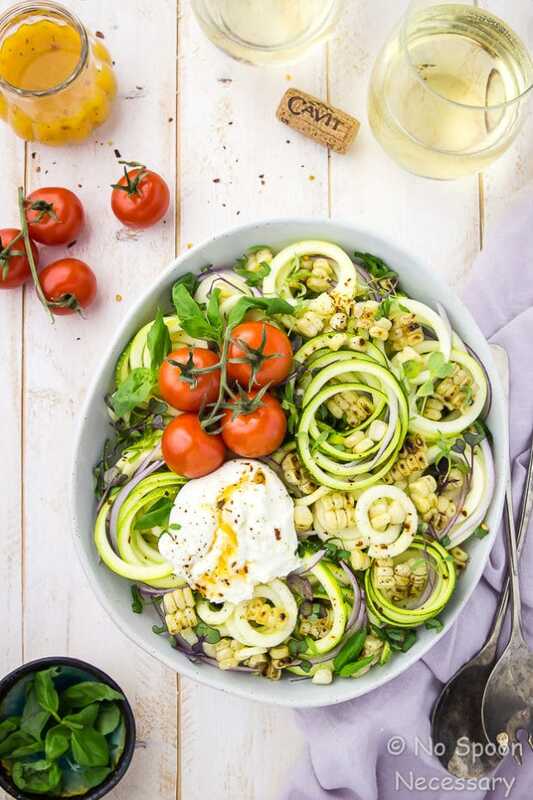 Crisp zucchini noodles tossed with silky Italian dressing; topped with charred corn, pungent red onions, juicy tomatoes, fresh basil and creamy burrata. 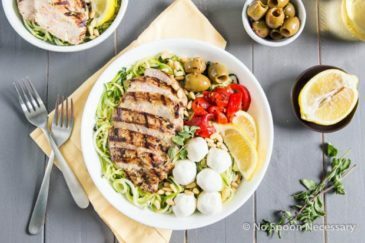 This Summer Italian Zucchini Noodle Salad is the perfect side for BBQs and entertaining! Straight up summertime scrumptiousness is happening here today! BUT, before we get to the food, let’s chat real quickly about the impending unofficial start of summer. I mean, is there anything better than dinning al fresco? Entertaining by the romantic light of candles giving all the warm-glowy-summer vibes? The smell of the grill and all its smoky-charred delicious glory? A perfectly displayed smorgasbord of sensational sides? And a BIG ‘ole, beautiful galvanized bucket of ice lovingly chilling bottles and bottles of wine? No, there is not. Obviously, right? Because, ALL that right there. ⬆️ That is SUMMER. While we all know the unofficial start of summer starts next Monday, on Memorial Day, what you might NOT know is that the FIRST National Pinot Grigio Day is this FRIDAY, May 26th! Cavit first introduced their Pinot Grigio into the US back in 1977. FOUR decades ago. And, to increase awareness of the variety, Cavit is ushering in National Pinot Grigio Day, which will be held every year on the Friday before Memorial Day. 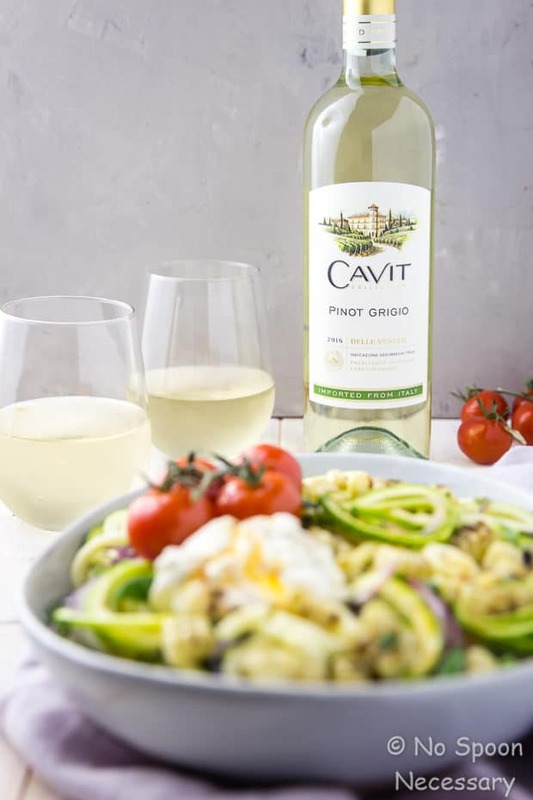 Cavit Pinot Grigio, with its appealing aromas, cool citrus fruit flavors, and light, refreshing taste is the PERFECT way to celebrate the national wine holiday. One sip of Cavit’s Pinot Grigio and you will KNOW this is how you want to entertain all summer. 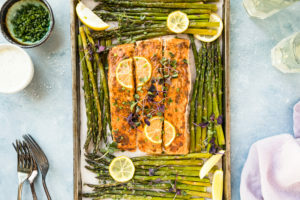 But, while you just shouldn’t have a summer shindig without a chilled bottle (or 5) of Cavit Pinot Grigio, you also need some easy, elegant eats to pair alongside. And that is exactly what I’m serving up today. 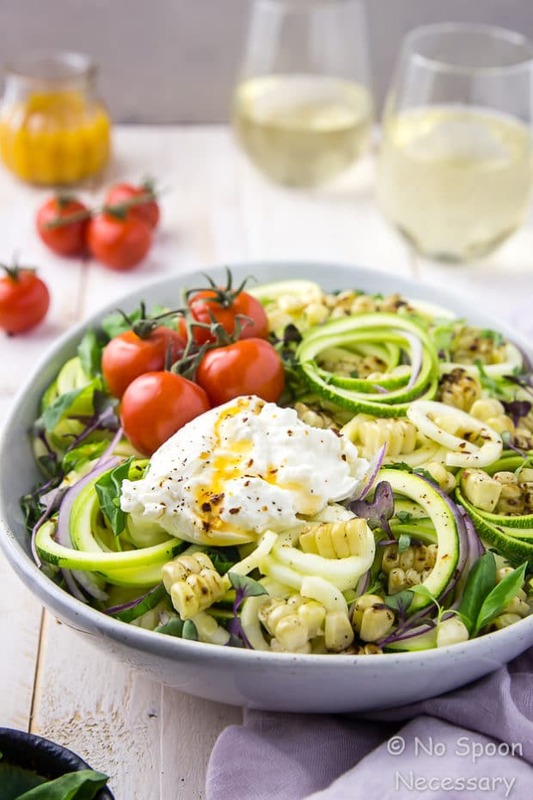 Fresh, cool, crisp, thick zucchini noodles tossed with silky, smooth Italian dressing; topped with smoky charred kernels of corn, juicy, plump tomatoes, pungent slivers of red onion, fresh herbaceous basil and creamy, rich burrata cheese. It’s easy, yet elegant, and bursting with fresh flavor. 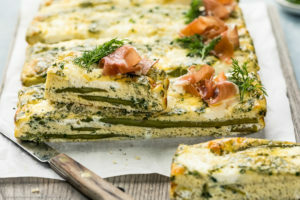 Plus, it’s super healthy with a touch of decadent cheese. 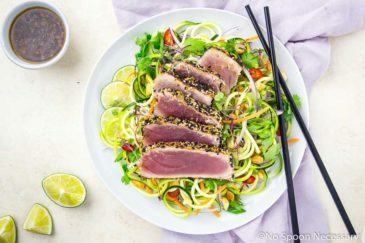 Basically, this salad is giving you LIFE. 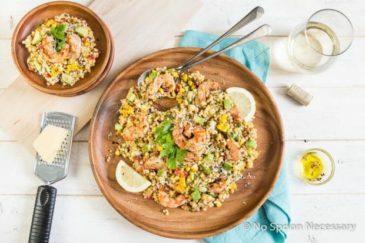 Pair it with a tall glass of Cavit Pinot Grigio and I guarantee this combo will be your go-to sides all summer. 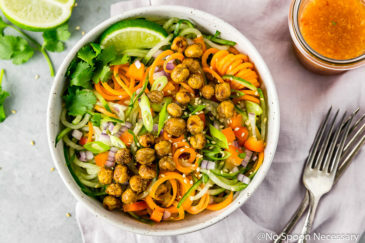 Aside from the taste, the best thing about this summer noodle salad is how easy it is to prepare. First, grill your corn. You guys got this step. Shuck your corn, toss it on the grill, and rotate that corny bad boy until it’s charred all over. 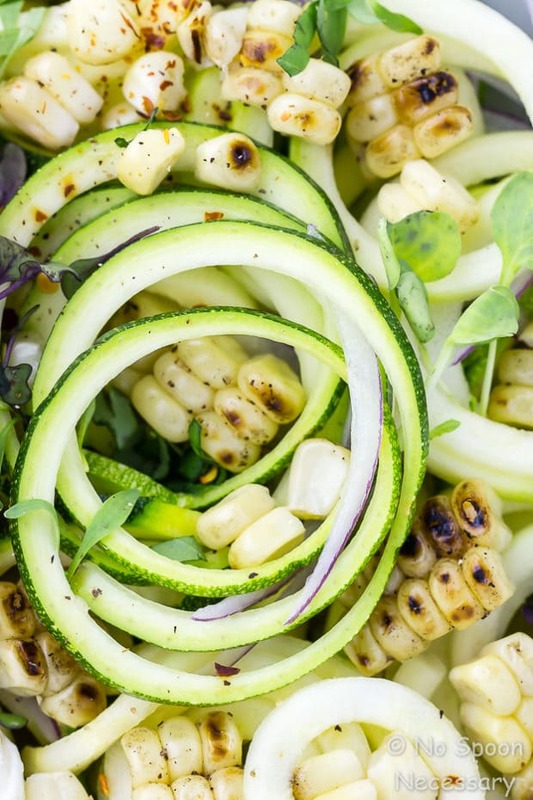 While the corn is grilling, spiralize a few zucchini, slice a red onion, chop some cherry tomatoes, and tear a bunch of fresh basil leaves. Dump all the veggies into a large serving bowl, drizzle with Italian dressing to taste and toss to coat. Once the corn is cool enough to handle, cut the kernels of corn off of the cob and add them to the bowl. Tear a ball, or two, of burrata into large chunks and scatter it on top. Drizzle everything with more Italian dressing, because you love ALL the flava, and serve. If you don’t have a spiralizer you can use a vegetable peeler to create long strands of zucchini. Or, you can use a sharp knife to thinly slice the zucchini lengthwise. If raw vegetable noodles scare you, feel free to quickly cook them for a of couple minutes in large sauté pan. Just make sure you season them with salt and pepper, sauté, and then simply proceed with the rest of the recipe as instructed. 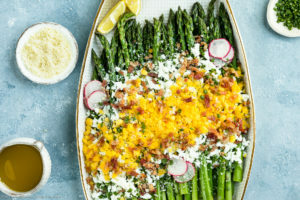 You can easily add whatever fresh summer produce you have on hand to this salad. You can substitute summer squash for the zucchini or use a combination of both. 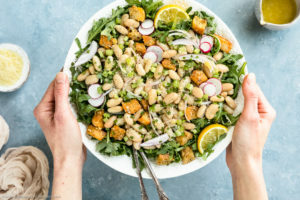 I encourage you to make this salad your own! 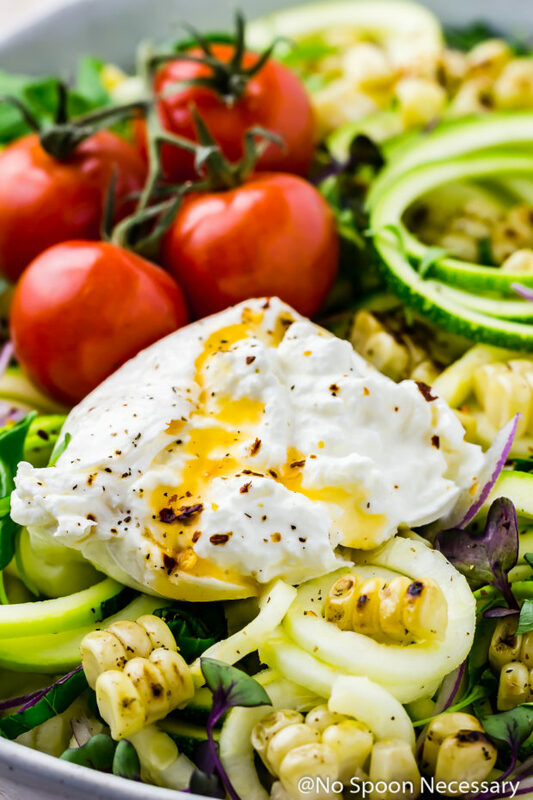 While burrata is one of my all-time favorite cheeses, and what I strongly suggest for this salad, you can substitute fresh mozzarella, ricotta or a combination of both. If you have never used burrata before, it is simply a handcrafted ball of mozzarella filled with creamy straciatella (mozzarella soaked in heavy cream). The filling kind of resembles ricotta. Burrata can normally be found in the specialty cheese section of your grocer in a tub-like packaging. 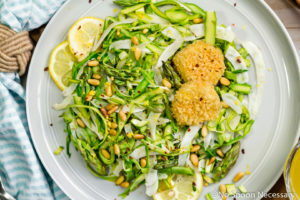 For this Summer Italian Zucchini Noodle Salad you can either use your favorite store bought Italian dressing, or you can make your own. I always recommend making your own so you can tailor it to your taste, and control what is going into it. I’ve included a recipe to make your own Italian dressing in the notes section of the recipe below. But, if you’re in a pinch there ain’t no shame in the store bought stuff! Until Thursday, cheers – to the sides of summer! 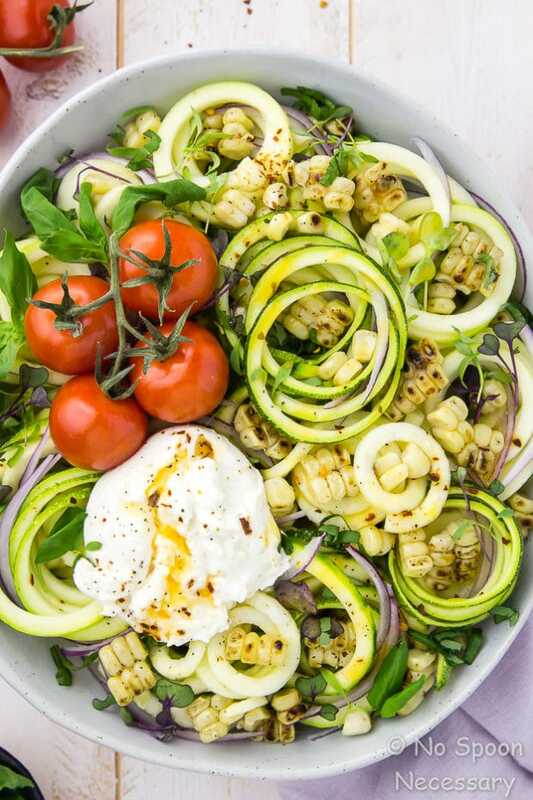 Crisp zucchini noodles tossed with silky Italian dressing and topped with charred corn, pungent red onions, juicy tomatoes, fresh basil and creamy burrata. 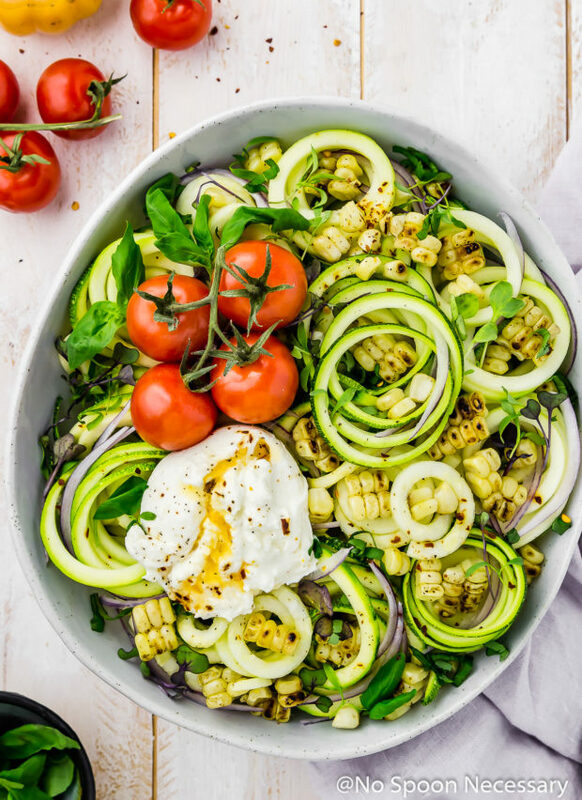 This Italian Summer Zucchini Noodle Salad is the perfect side for BBQs and entertaining! Grill corn: Preheat grill to medium. Spray corn all over with cooking oil and generously season with salt and pepper. Place corn on the grill and cook, rotating every 2-3 minutes, until corn is charred all over, about 10-12 minutes total. Remove to a clean work surface and set aside until cool enough to handle. Once cool, use a serrated knife to cut kernels of corn from the cob. 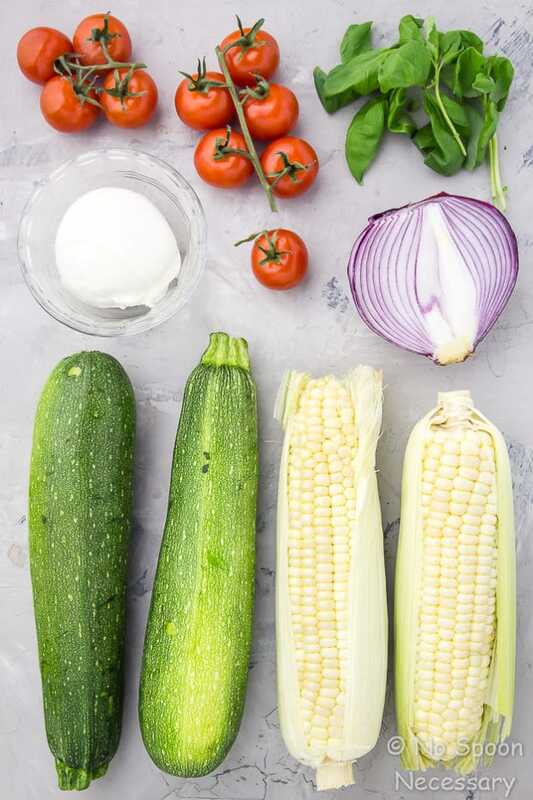 To serve: In a large bowl, gently toss the zucchini with cherry tomatoes, corn, red onion and Italian dressing to taste. Transfer to a serving platter or individual plates. Sprinkle with basil, top with burrata. Finish with desired garnishes if using. Enjoy! 1. If you don’t have a spiralizer you can use a vegetable peeler to create long strands of zucchini. Or, you can use a sharp knife to thinly slice the zucchini lengthwise. 2. If raw vegetable noodles scare you, feel free to quickly cook them for a of couple minutes in large sauté pan. Just make sure you season them with salt and pepper, sauté, and then simply proceed with the rest of the recipe as instructed. 3. You can easily add whatever fresh summer produce you have on hand to this salad. You can substitute summer squash for the zucchini or use a combination of both. I encourage you to make this salad your own! 4. 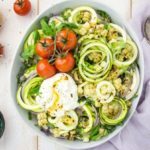 While burrata is one of my all-time favorite cheeses, and what I strongly suggest for this salad, you can substitute fresh mozzarella, ricotta or a combination of both. 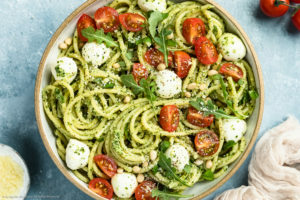 If you have never used burrata before, it is simply a handcrafted ball of mozzarella filled with creamy straciatella (mozzarella soaked in heavy cream). The filling kind of resembles ricotta. Burrata can normally be found in the specialty cheese section of your grocer in a tub-like packaging. 5. You can either use your favorite store bought Italian dressing, or you can make your own. I always recommend making your own so you can tailor it to your taste, and control what is going into it. But, if you’re in a pinch there ain’t no shame in the store bought stuff! Combine all the ingredients in a blender, or food processor, and process until smooth and creamy. OR, mince the garlic and add all the ingredients to a jar with a tight-fitting lid. Shake jar vigorously until everything is well-combined. Taste and adjust sweetness with sugar, and seasoning with salt and pepper. *Nutritional Information does not include Italian Dressing since the amount used is to taste and will vary.